If you want to eat like a local in Asia, then a must do on your list is eat street food. 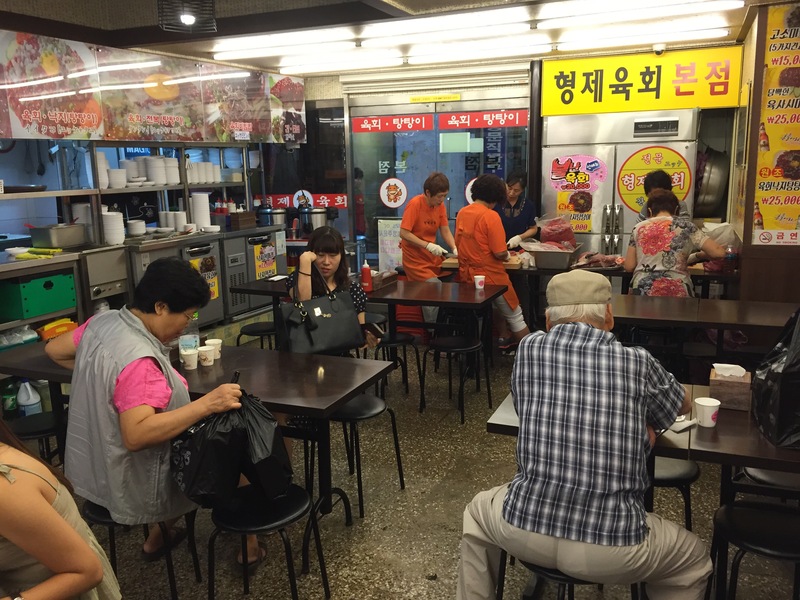 One great place to do it in Seoul is Gwangjang (Kwangjang) Market. We had heard about all their food alleys, and decided today was the day to try it all out! I mean what a way to kill many birds with one stone so to speak. Gwangjang is known as the oldest and one of the largest markets in Korea. 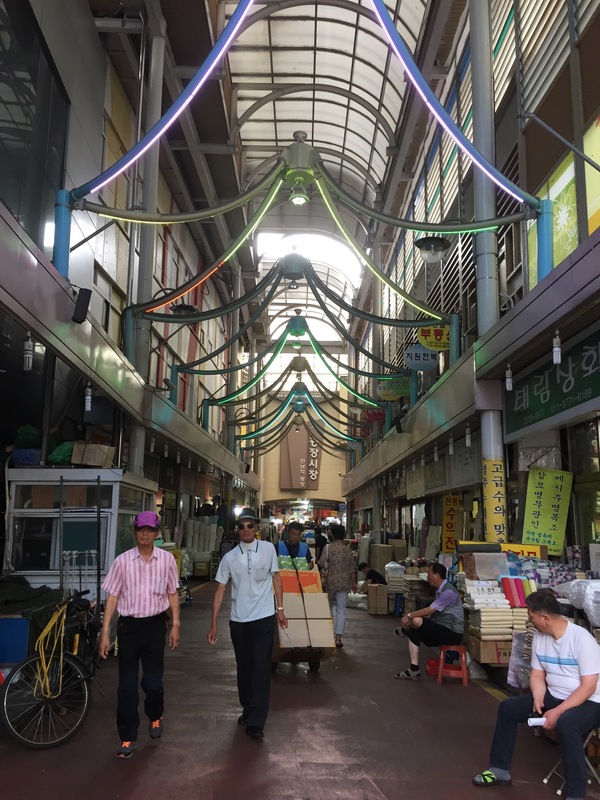 It is not as well known with tourists like Namdaemun and Dongdaemun are, but locals love it and I think that’s one of the best indicators of where to go. While we walked the alley ways, we were one of few foreigners roaming around. 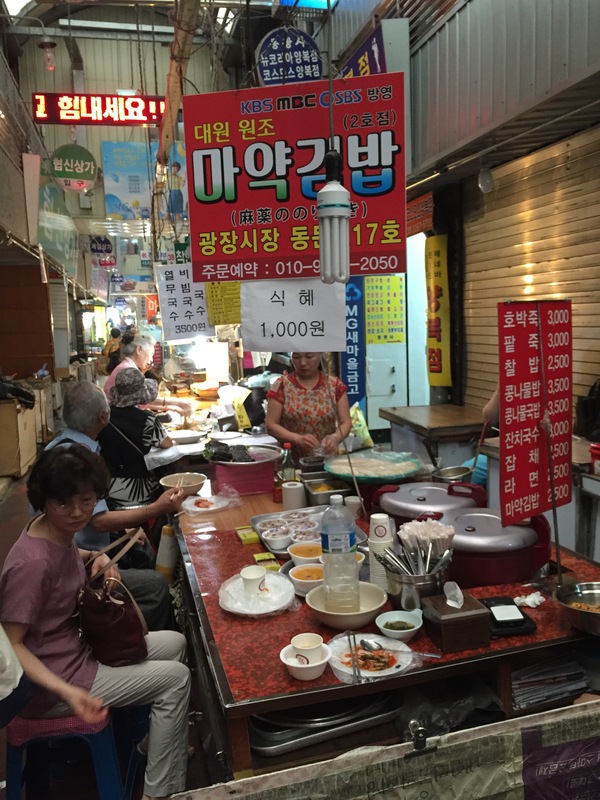 You can enter the market through Jongno 5-ga station. There are many exits, but we entered through exit 11 and that brought us right to Gate 1 of the market. 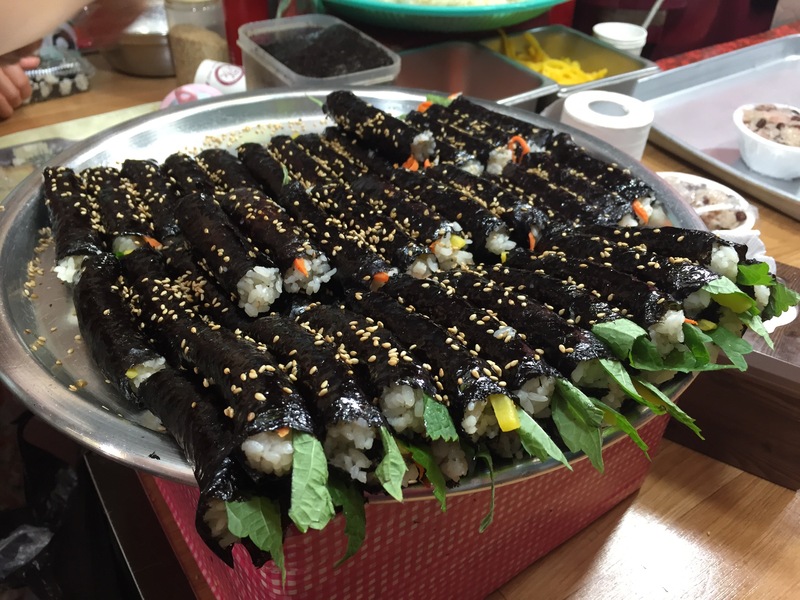 Our first order of business was to have some Mayak Gimbap (마약김밥). When you enter from exit 11, you walk straight into the market and when you reach the first cross street you continue on until you reach a second intersection and then you make a right. 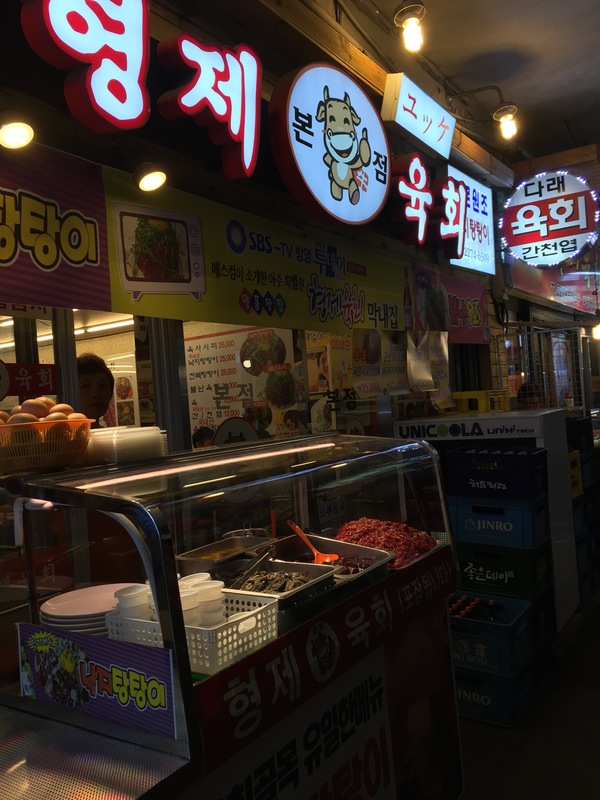 You will meander down a bit past the button stores until you see 5 food stalls and that is Mayak Gimbap Alley. We selected the last stall as there were already some people there. I first mentioned Gimbap a few weeks ago, but Mayak Gimbap (nicknamed Narcotic Gimbap because once you start eating it you can’t get enough!) looks like the baby version of regular Gimbap, it’s about the size of a cigar in thickness. It also contains very few ingredients and doesn’t contain anything like galbi or bulgogi that normally attracts me to Gimbap. 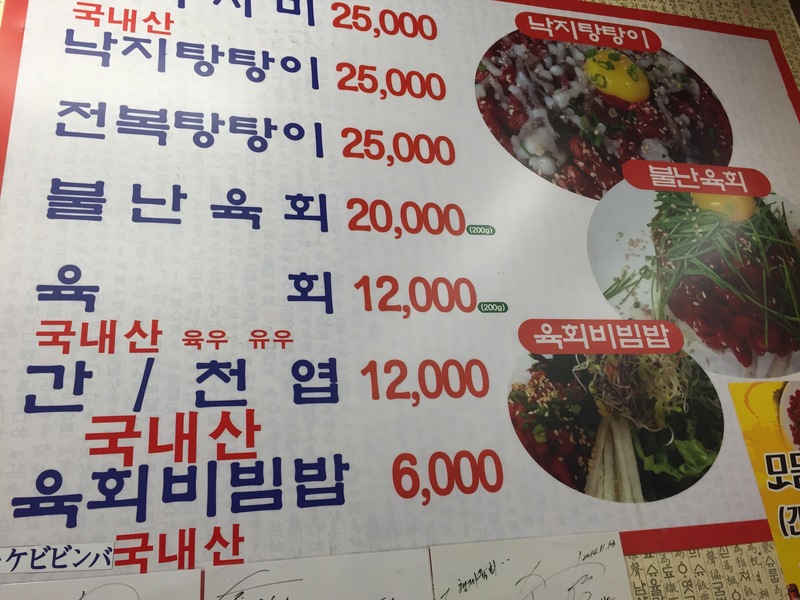 However, we sat down anyways and placed our order (a single person portion was 2,500 won). After one bite I was hooked! It really is delicious, you get the sweet, tangy and savory flavors all at once. You are also given a mustard sauce that has a good punch like wasabi and some picked radishes. 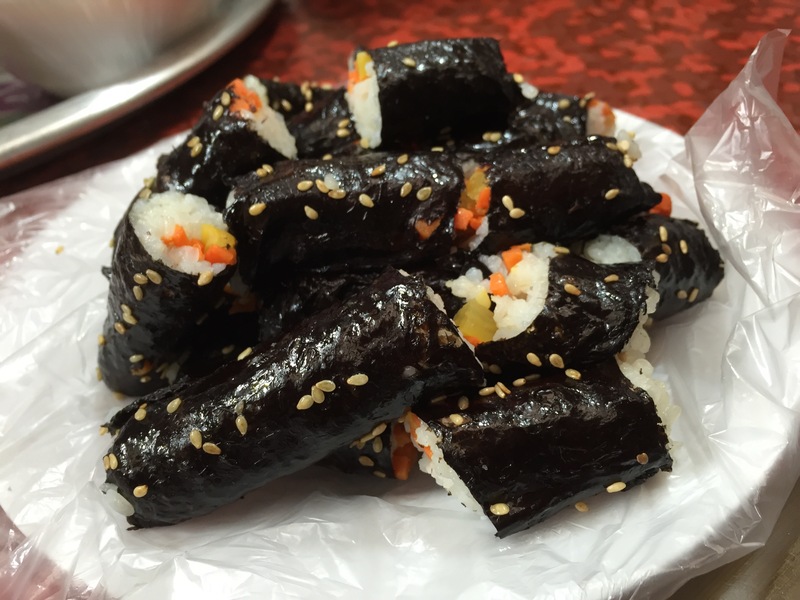 We scarfed down our Gimbap in no time, but no time for seconds, we have more eating to do! Next up was Yukhoe (육회) which is super thinly sliced raw beef that is seasoned and served a few different ways. You will go back to the first intersection after you entered into the market and make a right (opposite direction of Gimbap Alley). You will see Yukhoe Alley on your left. There are a few restaurants lining the small alley. I thought the happy cow at the end of the alley looked inviting so that’s where we went. 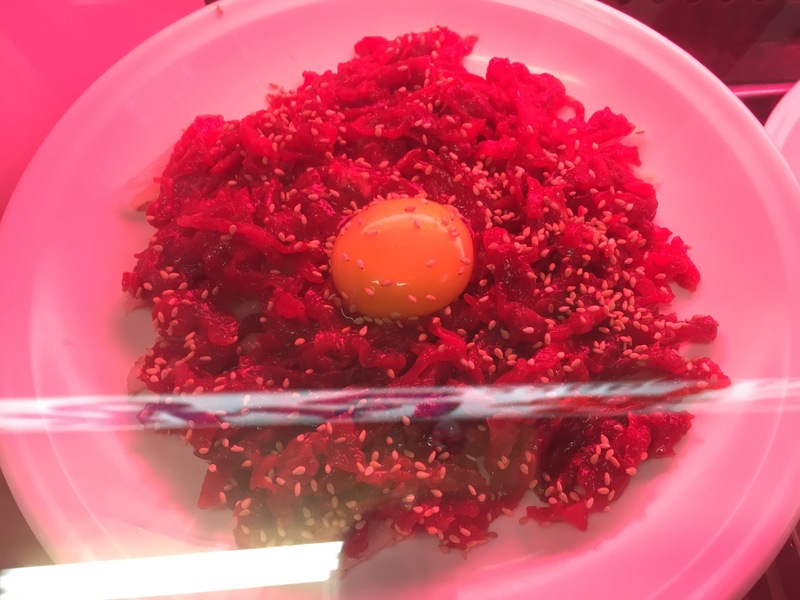 The most popular dish with the locals is the Yukhoe served on top of pear and topped with sesame seeds and egg. 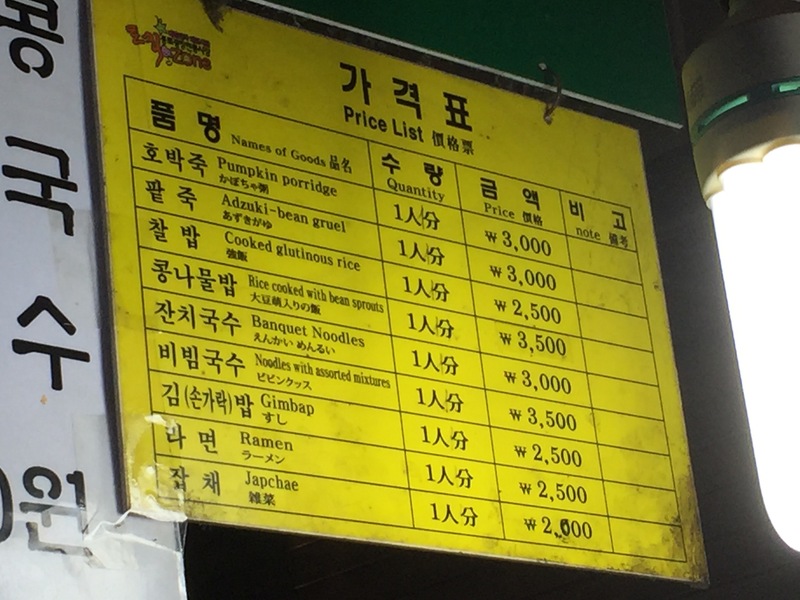 It costs a whopping 12,000 won. 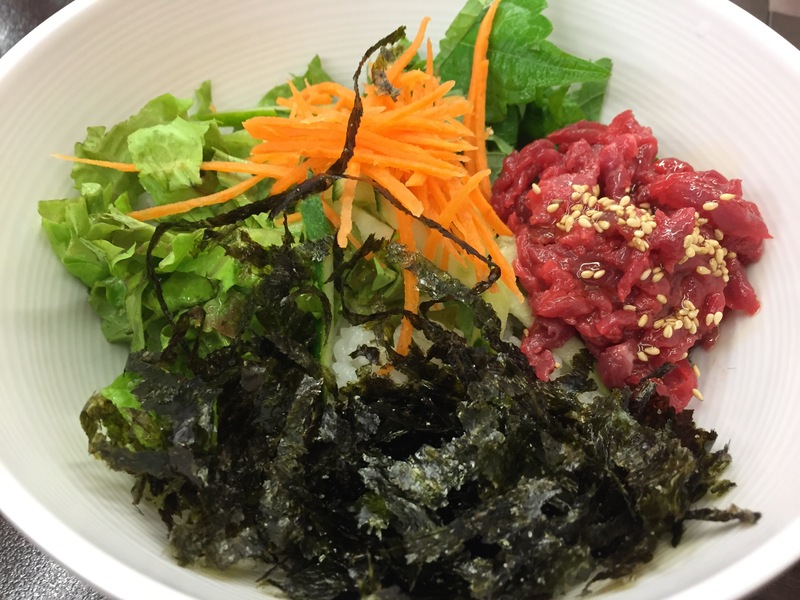 If the thought of eating that mound of raw beef and egg scares you just a little, I recommend easing yourself into the whole process by trying a Yukhoe Bibimbap! It’s only 6,000 won! That’s what we did, but we did taste the meat by itself first and I must say it’s delicious. You can really taste the seasoning, the sesame oil in particular stands out and the beef itself does not have any strange flavors at all. The beef is really at its prime of freshness! They also gave us a bit of daikon and beef soup, the broth was awesome. Such a great compliment to the bibimbap. 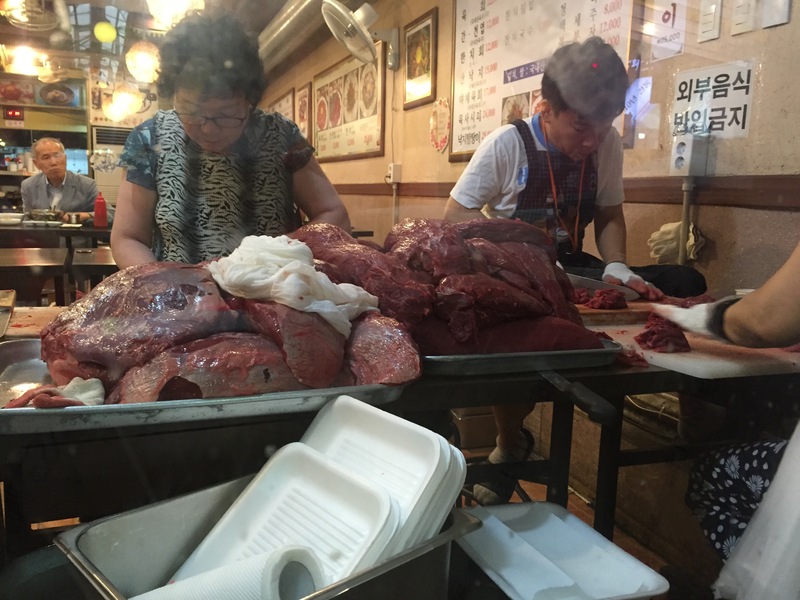 We actually watched the people at the restaurants cutting up the huge slabs of beef freshly for the day. All the beef here is high quality and fresh, never frozen. Okay, at this point if you still have room, you can check out Jeon (전) Alley. You just go back out to the main alley and continue on a little ways and you will see the many stalls selling Jeon. 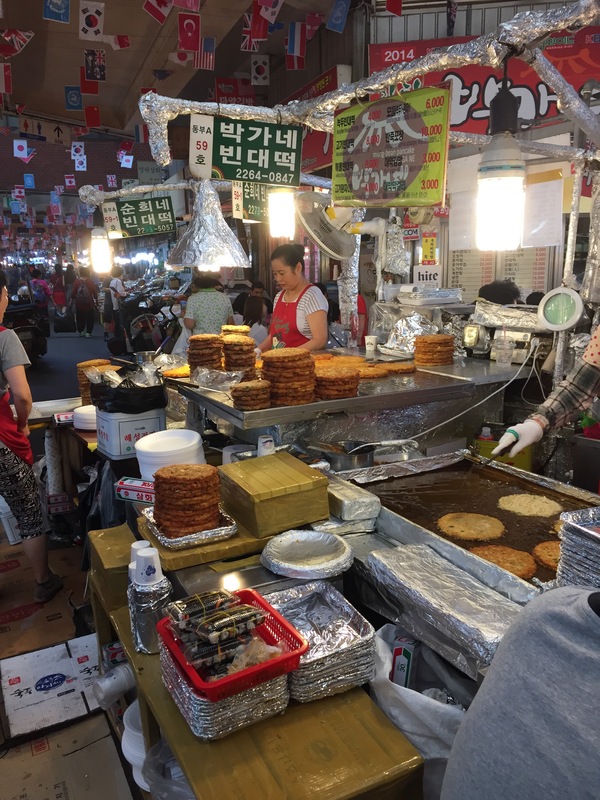 I shared with you the Pajeon recipe I learned, but the ladies in these stalls are experts and they make so many kinds of Jeon (Haemul, Kimchi, Hobak, Sosiji, you name it, they’ve got it). It’s definitely worth a taste. Finally, we closed off the day with a refreshing fruit juice from one of the small stands. They cost about 3,500 to 5000 won and are a great way to cool down. Previous Post Try a Hanbok on for size! 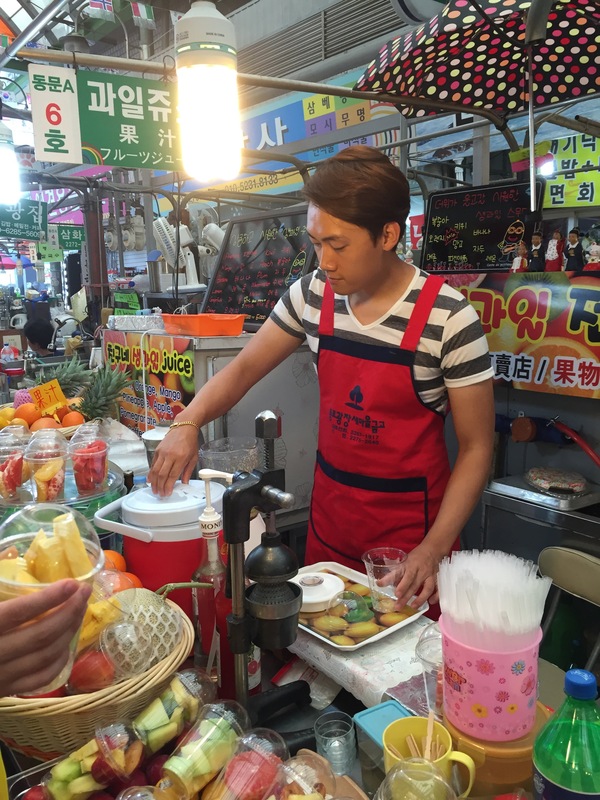 Next Post Can’t stop, Won’t stop shopping at Gwangjang Market!